A road in Hove was closed for a bariatric rescue this afternoon (Saturday 28 January). Bariatric rescues involve helping or moving obese patients, especially if they become stuck in their home. 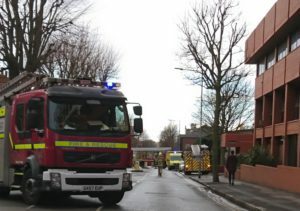 East Sussex Fire and Rescue Service sent three fire engines to close a stretch of Davigdor Road while a woman was helped from a property in the street. Bariatric rescues have become increasingly common in the past few years, with the fire service carrying out more than one a month on average – many of them in Brighton and Hove. They have become a separate category in official statistics as Britain’s obesity crisis has grown. Nationally the number of bariatric rescues rose from 709 in 2012-13 to 944 in 2015-16, according to reports from all 50 of Britain’s fire and rescue services. Firefighters often have to use specialist equipment, including special slings, and have had to remove windows, walls or fittings such as bannisters. The South East Coast Ambulance Service has reported dealing with about ten bariatric patients a week over the past three years. It has spent more than half a million pounds on specialist ambulances and equipment and given hundreds of paramedics specialist training. One of Britain’s leading bariatric surgeons, David Kerrigan, has been quoted by the BBC as saying people who become severely obese “are prisoners not just within their own body but within their own home”. What a disgraceful report, no news on how the lady in question is just an insult about her weight, I hope she doesn’t see this, shame on you. Where is the insult about the lady’s weight? She isn’t named and her weight isn’t given. It seems pretty factual, especially as it involved the highly visible closure of a bus route and the diversion of all traffic. Why? They don’t mention a name? It is factual? It is topical and reporting on an issue that is becoming more of a problem for individuals, their families and society. Obesity is costing the NHS significant sums of money, so this is news worthy. Yes, why , it’s costing the tax payer money , how much did that all cost and persons involved? Further, people are interested in why a road was blocked and what was going o. This is sympathetic reporting of the best and most useful kind. Dear reporter….are you absolutely sure that this article is correct? Was it not that the lifts in this property are too small to take a stretcher and it’s impossible to get people out of flats on the higher floors? I like this website, but you’ll loose followers with incorrect articles. Perhaps you were given the ring information by the emergency services. So this is news now? Shameful. And worse the ignorant comments. We know nothing of this person’s health issues yet we see fit to comment on the cost involved in rescuing someone who could have died. I swear some people are devoid of emotions! Maybe some people should not be body fascist. No one knows the citcumstances of this womans weight gain and typical of the ignorant. Crikey this is the first time I have seen more than 4 Comments in an article on this site.The worry is that whoever it is must have walked into this résidence but was unable to exit the same way. A lot of fatties getting upset about this article! lol. Lose some weight! You’re costing this country millions. 3 fire engines to get this fatty out the house!? What if there had been a fire, or something actually serious going on?